It's been 72 hours since I've had any sort of significant sleep. A thunderstorm and a teething baby mean that both my boys were inevitably up in the middle of the night. Were they awake at the same time? Of course not! They like to spread the love so that mom and dad get as little sleep as possible. Now all kidding aside, if you're a parent you've surely done this same kind of song and dance. You can likely relate to the ups and sometimes downs of parenting and the sometimes dire need to just press pause and relax. 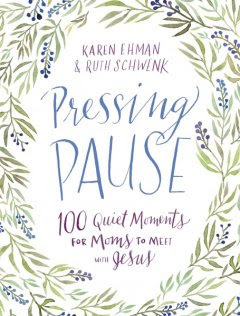 I was recently introduced to the devotional, Pressing Pause 100 Quiet Moments for Moms to Meet with Jesus By Karen Ehman and Ruth Schwenk. These two women understand the tasks of motherhood; the sleepless nights, the fears and triumphs, the dirty diapers, the screaming babies and uncooked meals but most of all the constant need for Jesus. Each day they present a Scripture verse and expand upon it's meaning with real-life, motherhood examples. At the end of each short devotional, there is a 2-3 sentence prayer and a couple questions to help you continue the study and apply the lessons to your own life. The first thing that caught my eye with this devotional is the stunning design. It's a hardback book with a purple string page marker and purple foil details on the cover. The design is simple and elegant and before I ever opened to the first page I was genuinely excited to read it. I judge a book by its cover, and in this case, I knew I had a winner. The inside is equally as beautiful with a tasteful purple and green design that carries you throughout the devotional. 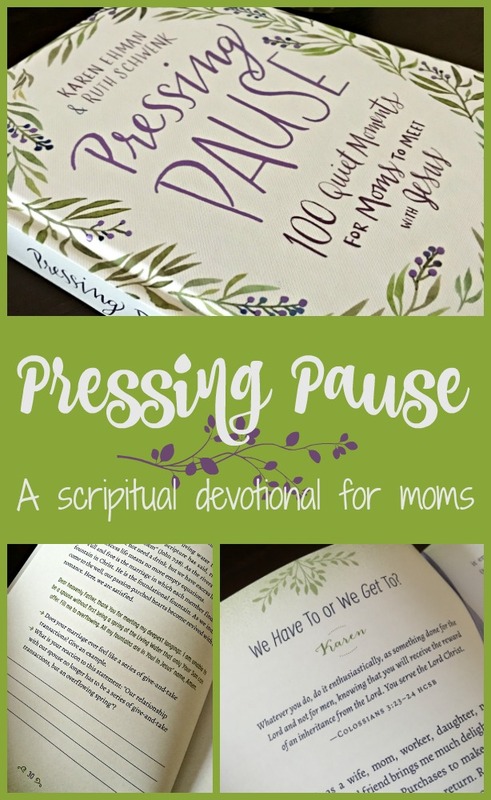 This is a great devotional for busy moms that need a little extra help to stop and find Jesus each day. I would not consider this a deep devotional - it just skims the surface of each topic but the authors do a fantastic job of relating the Scripture to motherhood. I do wish there was more space to write my thoughts after each devotional. Also, because there are two authors every other chapter is written by either Ruth or Karen and it says their name at the top of the passage. I had a hard time finding any kind of flow to the lessons but later mentally allowed myself to just let each individual devotional stand on its own. The authors do a great job presenting Biblical truth in a challenging and relatable way and I would recommend this book for any mom trying to connect with Jesus. Hint: this would make an incredible gift for first-time moms. It's awesome Dominique - easy to read but full of spiritual truths that mothers can easily relate to.